Should I Update My Recovery Partition to Windows 7? I continue answering Lee's question about increasing the number of Windows System Restore points. Last Monday, I explained when Windows' built-in system backup program, System Restore, creates its backups (called restore points) and how you can manually create your own. Now I'll discuss how to keep the restore points around a little longer. System Restore allows you to revert Windows and your applications back to what they were at a previous time, without effecting your documents and data. Windows deletes old restore points to make room for new ones. If you give the operating system permission to use more hard drive space for this purpose, it won't have to delete old restore points as often. How you do this chore depends on your version of Windows. In XP, click Start, right-click My Computer and select Properties. Click the System Restore tab. 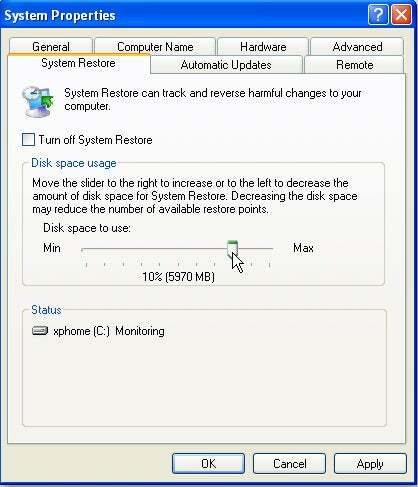 Make sure that "Turn off System Restore" is not checked, and set the percentage of disk space to be used. Someone at Microsoft must have figured that was too easy, because Vista makes the job much more complicated. Select Start, All Programs, and Accessories, right-click Command Prompt, and select Run as administrator. In the resulting command line window, type vssadmin list shadowstorage and press ENTER. Several lines of text will scroll up the screen. The last line, "Maximum Shadow Copy Storage space," will tell you how much space System Restore can use. To change it, type vssadmin resize shadowstorage /for=c: /on=c: /maxsize= n gb, where n is the number of gigabytes you're giving it. For instance, for 12GB, type vssadmin resize shadowstorage /for=c: /on=c: /maxsize= 12gb. Note the spaces before all of the slashes (/), even the ones after c:. Windows 7 makes it easy again. Click Start, right-click Computer, and select Properties. Click System protection in the left pane. Click the Configure button to access the appropriate control.